I have replaced some struts on a mk2 rallycar from 2 litre to capri the drum sticks seem to be hitting on the swaybar at close to full lock.I have put eccentric tops in at the time .Has been apart for a while being repainted and i dont remember this before.Also standard swaybar is used but pulled forward. Any advice would be good as would like to give it a run next weekend. what's a drum stick? and they go in from underneath? 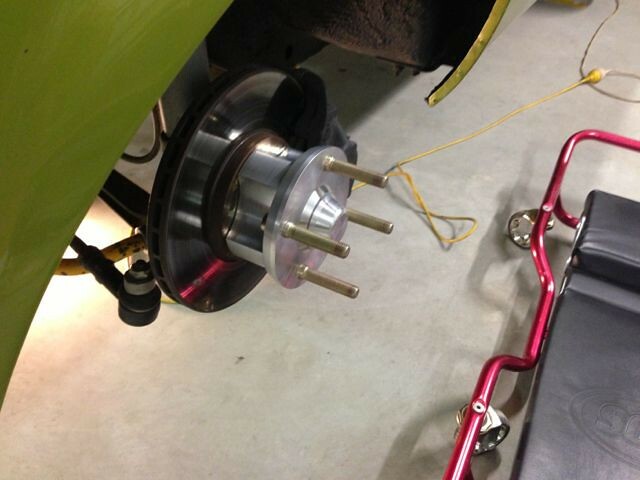 steering arms is what i meant from rack to tie rod end and they are coming from underneath. are they on the right side and pointing the right way up! If they were on top there would be more clearance to the swaybar. if you have a Mk2 steering rack you will need 'green' tierod ends to match the metric rack with the capri (imperial) steering arm taper. If you are still using the mk2 tierod ends the taper wouldn't seat properly which might be why they hit the swaybar?? Yes running mk2 rack steering arms on struts are machined out to take mk2 taper tie rod ends as makes spares easily available.looking at the car on the ground looks much better only guessing when at full droopwith platforms wound up may have caused it but havent seen this before.Will run it through lock to lock and have a better look tomorrow? yeah, putting it on the ground will help, also more caster might help as the whole strut leg is tilted back. An anti-dive kit will drop the swaybar out of the way a bit too. Are the steering arm on the right way up? What sort of 'rally' car do you have? Is it a low set tarmac car with perhaps a crossmember with lowered steering rack mounts for a gravel spec car?